ISLAMABAD — Pakistan’s military has rescued a U.S.-Canadian family from a tribal region bordering Afghanistan, nearly five years after they were abducted by militants. U.S. national Caitlan Coleman and her Canadian husband Joshua Boyle went missing in Afghanistan in 2012 and the Afghan Taliban later claimed responsibility for kidnapping them. The group, which released two videos of the hostages while they were in captivity, had been demanding the release of their prisoners in exchange for Boyle and his wife. She gave birth to the couple’s three children while in captivity. A Pakistani military statement said that based on “actionable intelligence from U.S.,” the rescue operation was successfully conduced in the Kurram tribal region near the Afghan border on Wednesday. President Donald Trump praised the release of the family from “captivity from the Haqqani network – a terrorist organization with ties to the Taliban.” He also called the develoment a “positive moment” in U.S.-Pakistan relations. The Haqqani network, whose leader is also deputy chief of the Afghan Taliban, is considered a terrorist group by the U.S.
Pakistani army spokesman Major-General Asif Ghafoor provided VOA with details of the operation to rescue the captives. “We swiftly deployed our troops soon after U.S. officials informed us at around 4 p.m. (local time) Wednesday the Taliban were transporting the hostages in a vehicle to the Pakistani side of the border. We traced the vehicle and safely recovered the hostages,” Ghafoor said, adding that U.S.-Pakistani cooperation was key to the mission. A U.S. defense official said the hostages are not in U.S. custody at this time. “A U.S. plane was available for them and they chose not to depart on it,” he told VOA. 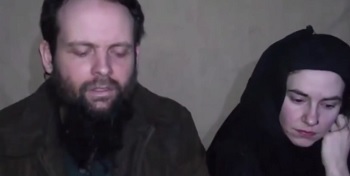 Coleman, 31, and Boyle, 33, in their last video message released in December 2016, urged then-President-elect Donald Trump to negotiate with the Taliban to secure their release in return for Taliban prisoners. Word of the couple’s release came as Lisa Curtis, National Security Council Senior Director for South and Central Asia, visited Islamabad as the head of a high-level U.S. delegation and held talks with Pakistani officials at the Foreign Ministry. An official statement issued at the end of the visit Thursday said the two sides reviewed the state of their bilateral relationship in the wake of the new U.S. strategy on Afghanistan and South Asia and agreed to continue discussions on all matters of mutual interest. Meanwhile, an American, Kevin King, 60, and Australian Timothy Weeks, 48, are being held hostage in Afghanistan. The two teachers, with the American University of Afghanistan in Kabul, were kidnapped at gunpoint near the campus in August 2016. In a video the Taliban released in June, the hostages begged President Trump to negotiate their freedom with the Islamist insurgent group. Pakistan did not help in releasing this family. Pakistan had them and knew where they were and could have released then at any time. But once again Pakistan is using situations like these to get on the good side of USA to receive funds.